Every woman has a unique hormonal signature that’s influenced by her natural rhythms and cycles, which impacts her metabolism, weight and well-being in profound ways. Traditionally, any hormonal signature that varied from the “perfect” female – normal, young and healthy – has been viewed as a weakness that had to be “dealt with” and caused discomfort and weight gain with no way around it. However, nothing could be further from the truth. These variations are actually an asset that, when harnessed properly, can give you a significant metabolic advantage compared to men. It all starts with discovering your Hormone Type. You can unlock this innate female super-power when you identify your female Hormone Type and harmonize your daily life around that type. While there are an infinite number of unique hormonal signatures a woman can have, Dr. Teta’s clinical experience has revealed most women fall into one of 7 core Hormone Types. 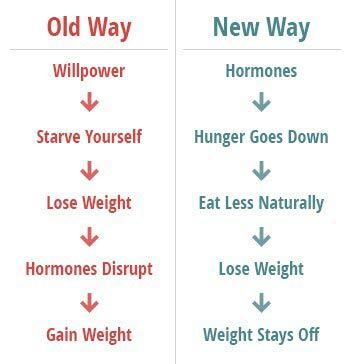 That’s how Metabolic Renewal is able to support the unique needs of YOU: your unique body, your unique hormones, your unique metabolism and your unique mindset. Instead of fighting against your powerful female hormones, it puts them to work FOR you to help you burn fat, feel fantastic and live long. Understanding your Hormone Type is crucial, because the foods, exercises and lifestyle changes that help one Hormone Type lose weight and feel great may make another Hormone Type gain weight and feel worse. Once you discover your Hormone Type, you can eat, exercise and live in a customized way that helps you thrive, while avoiding the one-size-fits-all approaches that never work. However, your Hormone Type is just a starting point… it’s a reflection of where you right now at this moment. Your hormone signature may change as your health improves or as you mature in life. That’s why Metabolic Renewal also gives you the tools and wisdom to change as your Hormone Type changes. That can be a different experience for women who are still menstruating, those who have gone through menopause, or anything in between. Whether you change from day-to-day, week-to-week, month-to-month or year-to-year, Metabolic Renewal will be there for you with Dr. Teta’s customized, clinically-proven, “4 M” framework for the female metabolism. Metabolic Renewal optimizes your female metabolism using Dr. Teta’s clinically-proven "4 M" framework. Unlike the many quick fixes out there, this framework is designed to work for the long term. Now you can lose weight and feel great for the rest of your life. 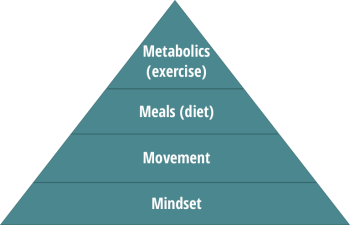 Imagine your metabolism as a pyramid with 4 levels. The base provides a strong foundation and each level builds on top. This results in a strong, resilient structure. It can handle any stress that life throws at it. Surprisingly, diet and exercise are not the most important parts of this pyramid. There are two other areas that are even more important. When it comes to your female metabolism, the strong base is actually your mindset. That’s because the female metabolism is far more sensitive to stress than a man’s. "Over 75% of doctor visits are stress-related." This is for good reason. Since women are the child-bearers, the female metabolism needs to be more in tune with its environment. In ancient times this is what allowed female intuition to know whether becoming pregnant would be a good idea or not. When you’re stressed, your body releases the stress-hormone cortisol. It can disrupt sleep, irritate your mood, impair thyroid function and slow metabolism. It can also increase appetite and cravings and force weight gain (particularly around the belly). Making matters worse, research shows women generally carry more stress in their lives than men. It may be the 21st century, but women still mostly end up being responsible for running the household. Women are the ones who notice when things need to be done. And they’re the ones that plan and organize how to get those things done. Social scientists call this phenomenon the "mental load." That’s why there’s a huge focus on resting, relaxing and recovering in Metabolic Renewal. This "me time" can serve as a wonderful antidote to the damaging effects of cortisol. Ironically, cortisol itself is not the enemy. It can be your best fat burning friend under the right conditions. Metabolic Renewal teaches you how to use cortisol as an advantage to burn fat even faster. Most people believe exercise is the key to weight loss. While it certainly is important, there’s another physical activity that is far more important: movement. It’s technically referred to as Non-Exercise Associated Thermogenesis (NEAT). And it’s an often-ignored, but crucial part of the female fat-burning metabolism. 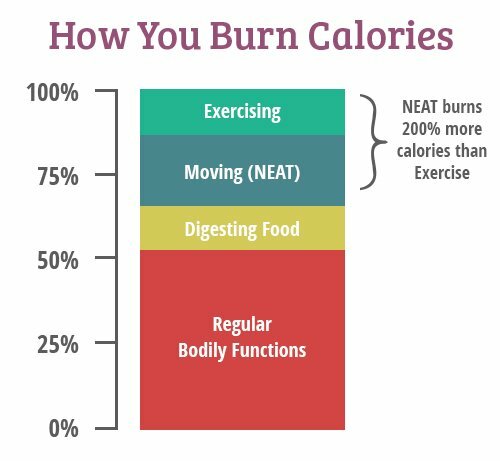 NEAT burns 200% more daily calories than exercise. That’s why women who walk and move a lot are thinner and healthier than those who don’t (even those who exercise). However, NEAT doesn’t just include walking… it includes all the moving you do during your day. Things like standing up and sitting down, fidgeting, typing on your computer, even breathing. First, movement helps blunt the effects of the fat-making hormone insulin. That means when you get enough NEAT, more of the food you eat gets burned for energy and less gets stored as fat. Second, moving enough helps to reduce the stress-hormone cortisol. Too much cortisol can break down muscle, bone and connective tissue. It can also encourage fat storage, especially around the belly. That combination can have disastrous consequences for the female figure and health. That’s why in Metabolic Renewal you’ll get simple NEAT activities you can do daily. They help protect your body and brain from the damaging effects of cortisol. And help keep you fit, lean and happy by keeping fat-storing insulin under control. Most programs force you onto a restrictive, one-size-fits-all diet. They rely on iron-fisted willpower to lower calories or ban entire food groups. Not only is that not enjoyable, it doesn’t work for long. Metabolic Renewal takes a different, hormones-first, approach. Once you get in sync with your hormones, your hunger and cravings normalize. And you eat fewer calories, naturally… not by force. You are unique: metabolically, psychologically, and in your preferences. You must find the diet that’s right for you. When you don’t, things backfire. When you do, life gets easier, fast. That’s why Metabolic Renewal teaches you to become a metabolic detective instead of a dieter. You’ll create your own diet that works for your hormones, your metabolism and your food preferences. First, you’ll discover the foods your body needs, at the right times, to get the most out of your workouts. Eating the right foods, at the right times, can make a huge impact on how effective your workouts are. Second, you’ll learn how to eat in cycles that are in sync with your natural hormonal rhythms. This cyclic eating method helps your metabolism stay in fat-burning mode and away from frustrating plateaus. And third, you’ll get delicious recipes and detailed shopping lists as a guide. However, this is just a start. You will learn to create a diet built for you, by you… and how to change it as your hormones change. This 3-step hormones-first approach works regardless of whether your menstruating or in menopause. It’s what programs your metabolism to burn food for energy, instead of storing it as body fat. That’s what leads to consistent weight loss, all-day energy and relief from chronic symptoms. The first 3 Ms are fantastic. They create a healthy, hormone-friendly way to lose weight and keep it off. However, unless you are a genetic goddess, the 3 Ms aren’t enough to craft a lean, shapely physique. That’s where metabolics helps… otherwise known as working out. But not the traditional kind that forces you to work out harder if you aren’t getting results. That can stress the female metabolism, disrupt your sensitive thyroid and adrenal glands and make you feel worse. The answer, instead, is to workout smarter. That’s why Metabolic Renewal features Dr. Teta’s famous 45-second, "intelligent" 3-in-1 exercises. They combine cardio, resistance and fitness training into a single, hyper-efficient move. These "intelligent" workouts stimulate your metabolism to keep delivering results for up to 48 hours. That means your body keeps burning fat and sculpting lean muscle on the days you’re resting. This "metabolic effect" is something the traditional long, boring workout cannot deliver. Plus, they’re super-convenient. You can do them in the comfort of your own home and save hours of driving to the gym. You can even do them in a hotel room while travelling or on vacation! Each of the 4 workout phases is designed to upgrade your body and metabolism in a safe, methodical way. Step-by-step you enhance your nerves, muscles, coordination, strength and conditioning. Finally, these workouts help re-vitalize your body to ensure your heart and lungs stay strong, your bones stay sturdy and your mind stays sharp as you age. Some programs give you exercise but no nutrition; others nutrition but no exercise. And nearly all skip over the crucial mindset and movement that are so critical to nourishing the female metabolism. That’s where Metabolic Renewal shines as it includes them all. Metabolic Renewal is much more than a simple exercise or fat-loss program. It is meant to be a holistic, comprehensive guide to developing a way of eating, exercising, and living that works for YOU. When you find that path, extraordinary things can happen. In addition to burning fat, you may find that mood swings, cravings, cramps, and bloating disappear. You may feel more energetic and focused than you have in a long time. You will be ready to tackle life again—maybe even in a way you never have before. After all, life is short. We all want to make the most of it. Metabolic Renewal will help you do that.